Nick Graves is a miserable man. Every day he comes home from his dream job to a stale marriage. On the day he finally summons the courage to tell his wife, Eve, he wants a divorce she has exciting news for him – she’s pregnant. Nick is a spiteful man. He purchases his dream home in an ideal location far away from family, friends, and cowor­kers. It’s a life changing decision he’s chosen to make without Eve’s con­sultation. Nick is a terrified man. He quickly realizes the resi­dents of his new hometown are a bit eccentric. After a trip to the local doctor’s office Eve begins to behave strangely. And once Nick finds out what’s really going on he’ll never be able to look at Eve the same way. There are good books and there are bad books. At least that’s what I sometimes want – that light-hearted simplicity: I like = good; I do not like = bad. It gets really interesting, when you really want to like a book – you almost feel compelled to rave about it and experience the same joy and excitement as so many others. 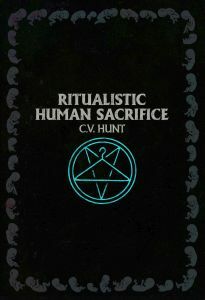 Unfortunately, for me that won’t work with Ritualistic Human Sacrifice. C.V. Hunt writes from the perspective of a (or the ) man/husband – or at least she tries. Because instead of a change of perspective, you experience the interpretation of a woman – here doesn’t speak a man, but formulate a woman! And exactly this is my biggest criticism: just because you want something, doesn’t mean you’re able to! This (unfortunately miserably failed) attempt to change perspective makes the (presumed) seriousness a shallow feat. Unfortunately, the story itself is boringly predictable. After the blurb, you need neither imagination, possibility or option; creativity as the worst enemy of the author, may not be experienced too often (and I’m not sad about that) – read the blurb, scroll to the end and think a good load of blood in between… et voila: Ritualistic Human Sacrifice. Hunt doesn’t want to show me anything, that wouldn’t have been better presented twenty years ago. Now I want and have to be fair: it’s not the style of Hunt, which I criticize here! Here she knows how to captivate! Even the most extravagant portrayals of violence, she doesn’t know clumsy, but in almost best tradition to celebrate. However, as the language is deliberate and the mood chosen, it simply can’t fool over the plumpness of the plot! It just goes together: the language that makes the mood grow and the plot that drives the mood! Language: consciously chosen, situational and suitable – here she worked consciously. Mood: awesome! Dry, clear and unpleasant (in a good way!) – that’s what makes horror! What does the book want to tell me? What does Hunt want to show me? Maybe I want to interpret, but there is no intention to be interpreted? What remains to me, is an involuntary persiflage; a mere average black parody of "The Stepford Wives" (2004, Frank Oz), which almost annoys in its irrelevance. …but the cover is nice!